We just got back from a brief camping trip up in Yosemite. Sure, we enjoyed the sights to be seen in one of our nation's most impressive national parks, but we were most excited about doing some outdoor cooking! When camping in the past, we have usually cooked over a propane stove. On this trip we were inspired by posts over at Cowgirl's Country Life and decided to do all of our cooking in the fire pit. 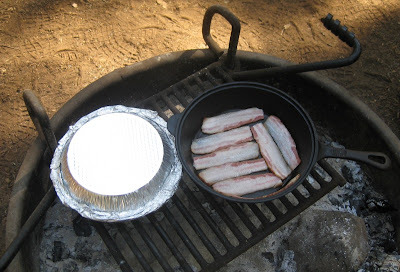 The most important camping meal is breakfast. 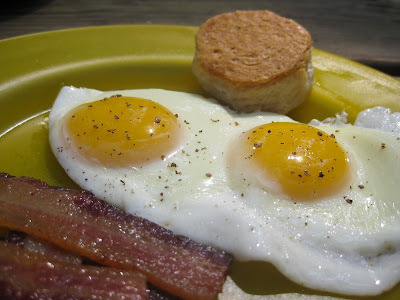 Thick slices of homemade applewood-smoked bacon, eggs cooked sunny-side-up in the drippings (of course), and tin-pan-oven baked biscuits - all hot off the fire. What's not to like? Hi there - just stumbled into your lovely blog via your "making pancetta" post, which was drooly and inspiring. But this - the best thing about camping is the open-fire meal, no doubt. It looks terrific - and after seeing your pics, I can smell that smoke in the air now. Hi Marilyn - thanks for stopping by! There is definitely something special about camp cooking - it just makes food taste better.